A campaigning suffragist who became Newcastle-upon-Tyne's first female GP has been honoured with a plaque. Ethel Williams set up her practice in 1904 after championing better health care for women and children. Despite graduating from the London School of Medicine, she had to gain her internship abroad as women at that time could not train in British hospitals. A plaque commemorating her achievements has been erected by the local council on the house where she lived. Reality Check: Where are all the female statues? 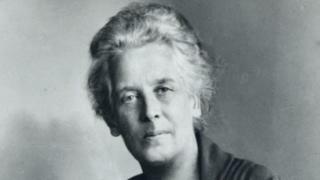 Ms Williams, who died in 1948, co-founded the Northern Women's Hospital in 1917. At the time of her retirement in 1924, there were 14 female doctors practicing in Newcastle. Newcastle City Council cabinet member for culture, sport and public health, Kim McGuinness, said: "Newcastle is a city with a rich heritage and a history of striving for equality. Ethel Williams' remarkable story is part of that. "This year we celebrate 100 years since some women got the vote. Commemorating great women who played a part in making the city the great place it is today is part of that celebration and it's fantastic to see Ethel Williams honoured." The city's Lord Mayor, David Down, added: "In many respects Ethel Williams was a woman ahead of her time. She vigorously campaigned for women to get the vote and as a GP did a huge amount to improve the health and well-being of women and children." Ms Williams, who was born in 1863, was an active member of the National Union of Women's Suffrage Societies and the Women's International League for Peace and Freedom. She went on to become a justice of the peace and a member of the Medical Women's Federation. The Ethel Williams' Halls of Residence was opened in her memory in 1950 at Newcastle University.